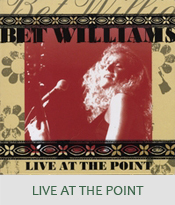 Bet Williams is a fearless vocalist and dynamic performer whose four-octave-range voice has mesmerized audiences across America and Europe. Williams' music blends folk, rock and roots rhythms with intelligent lyrics and infectious hooks. With a gift for storytelling and spontaneous humor, her stage performances go from the profound and poetic to wild and spontaneous, at times bordering on performance art. When I was thirteen, living in Virginia, I got my first guitar. With the two chords I had just learned, I pressed my fingers into a sad love song (after all I was thirteen). Many chords and some decades later I am still writing songs. Some sad, some funny, some poignant, confessional or wild. But over the years I found that what I really like to do is play live. I spent my college years playing with groups like Bookends and Ticapoo Brain. I made my first CDs in Nashville with producer Brad Jones (Jill Sobule, Marshall Crenshaw) and Jim Rooney (John Prine, Nanci Griffith). I was too quirky for Nashville so I headed up the coast to play in Philadelphia and New York where I found some lifelong friends and a great music scene. I’ve shared the stage with some great musicians including Lucinda Williams, Bobbie McFerrin, Arlo Guthrie, Taj Mahal, Joan Osborne, John Gorka, Annie Haslam, Herbie Hancock and a bunch of other wonderful people. I’ve had my California years with record deals, great actors and big promises. I’ve worked on organic farms, danced at Rainbow Festivals, and marched against wars. I’ve had my New York City and Woodstock years. Since 2010 I’ve been creating the Berlin chapter of my life with my husband, composer John Hodian and our amazing son, Jack. Now I survive (spiritually and financially) by touring with the Bet Williams Band as well as the new-world-folk ensemble Epiphany Project. From New York to California to Berlin to Armenia, I sing songs for a living. It's an interesting life. A strange, magical, and interesting life. March 9 • Lahr Schlachthof Live Video Shoot of the show!